Prepare your own exclusive meal under professional guidenense of a chef. At the end of the day the ship will anchor and you will enjoy your own dinner in a special environment. Departures with the more than 100 year old clipper from the old town Muiden. 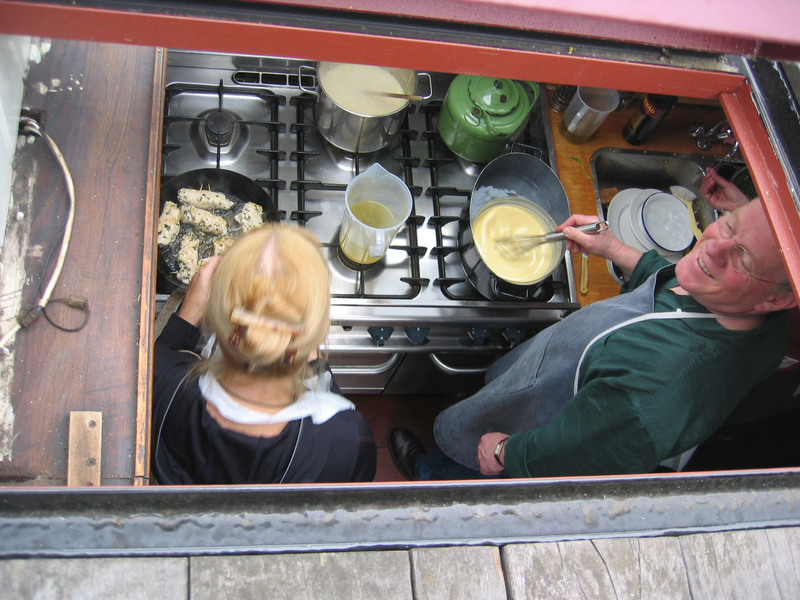 Reception on board by the crew and the chef with coffee and ‘Muider kruidkoek’. After the reception the ship will depart from Muiden towards the IJsselmeer. During the trip you will be preparing an exclusive lunch and nice snacks for the afternoon. The ingrediënts already are on board of the ship and a complete furnished kitchen will make the cooking very pleasantly. On a silent place the ship will anchor and you will enjoy your special prepared meal with a superb wine. The ship sets sail and continues its trip. Time to enjoy the selfmade snacks. Reception on board by the crew and the chef. The lunch will be ready for you. After departure from the harbouw the sails will be set and the chef will explain the details about the meal and the snacks that will be prepared. The ingrediënts already are on board of the ship and a complete furnished kitchen will make the cooking very pleasantly.